KyronMAXTM structural thermoplastics compounds are short-fiber thermoplastic materials that are said to consistently outperform long fiber thermoplastic compounds in mechanical strength. Photo courtesy of Piper Plastics. CHANDLER, Ariz.–Piper Plastics, aware of customer demand for a short-fiber thermoplastic material that would outperform the mechanical strength of long-fiber thermoplastic (LFT) materials, knew that it had to do something. 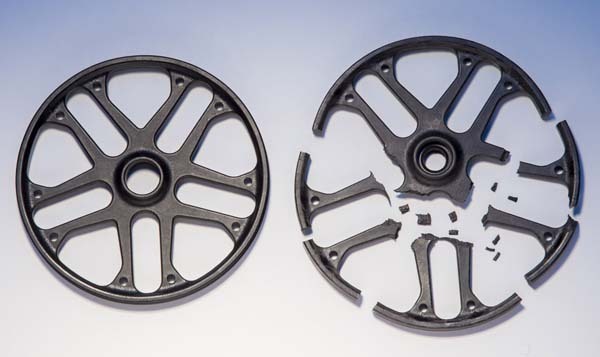 Piper responded by developing the KyronMAXTM series of structural thermoplastic compounds, which it calls "the next generation in injection moldable metal replacement technology." "Our customers wanted the strongest moldable polymers available without all the process and design limitations associated with LFT polymers," explained David Wilkinson, polymer technology manager at Piper Plastics, in a press release. "KyronMAX materials consistently outperform LFT polymers, especially when measuring the performance of the molded part, which is the true test. They overcome all the limitations associated with LFT compounds while yielding stronger molded parts that are also lighter in weight." Piper Plastics is a provider of high performance polymer materials and precision machined plastic components and assemblies. What makes KyronMAX technology unique is that it is based on short fiber technology, so the polymer behaves similarly to the isotropic nature of metal and eliminates the processing and fiber breakage concerns associated with LFT compounds, the company said. The technology is said to enable very complex parts to be molded with "unrivaled mechanical performance and consistency." An exciting feature of short fiber technology, according to Piper, is that very complex parts can be molded with wall thicknesses down to 0.015 inch (0.038 cm). Competitive structural compounds use high fiber loadings and long fiber lengths to achieve the desired mechanical performance. However, the performance of these materials often does not translate into the molded parts, due to loss of weld line strength and reduction of fiber length during processing. In contrast, KyronMAX technology is reported to outperform all other thermoplastic compounds using short fiber technology and much lower filler loadings. "The lower filler content results in a tough, structural plastic that can be utilized in extremely aggressive applications, yet is still processing friendly and does not require specialized molding equipment," said Wilkinson. "We are consistently replacing LFT polymers with KyronMAX polymers that are 20 percent lighter and 20-50 percent stronger," added Wilkinson. The KyronMAX technology platform, exhibiting tensile strengths above 51,000 psi (352 MPa) and flexural modulus above 6,500,000 psi (44,816 MPa), is currently formulated in various thermoplastics, including PA, PPA, PPSA, PEI, and PEEK. More are currently in development, according to Piper.